Asian markets rose in the morning sessions following a strong overnight rally on Wall Street and European markets. Despite China announcing a lower-than-expectation 1Q12 GDP of 8.1% (consensus: 8.4%), Asian shares held steady as the discouraging data lifted hopes of fresh monetary easing by Beijing. Amid strong buying support on Tenaga following its positive 1H12 results, KLCI gained 1.9 points at 1603.1. Despite clouded by mostly negative external developments, KLCI inched up by 4.3 points in a holiday-shortened week, mainly on local fund buying support with local institutionals accounted for average 56% of last week’s daily trading participation value. 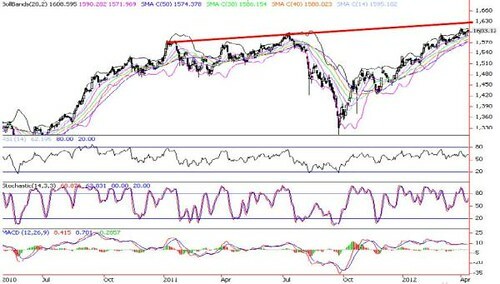 In the wake of negative external woes, KLCI’s upside potential is limited ahead of the looming general election. However, we see no immediate risk of significant reversal due to buying support from government-linked funds, driven by acceleration of the ETP announcements. 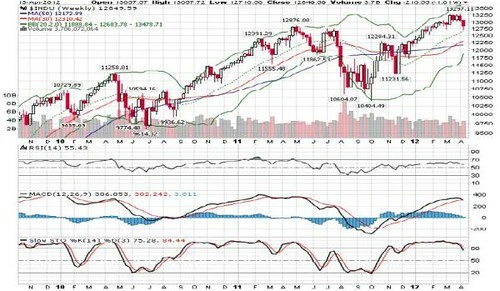 Immediate resistance is historical high at 1609, followed by the weekly upper Bollinger band of 1624. 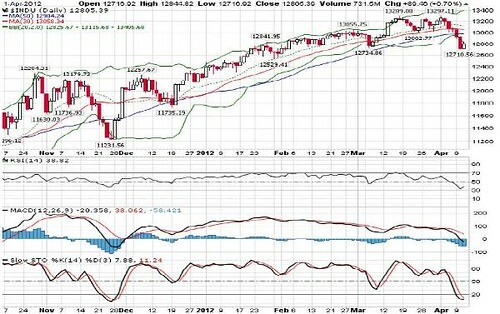 Immediate supports are 14-day SMA (1595) and mid Bollinger band (1590). 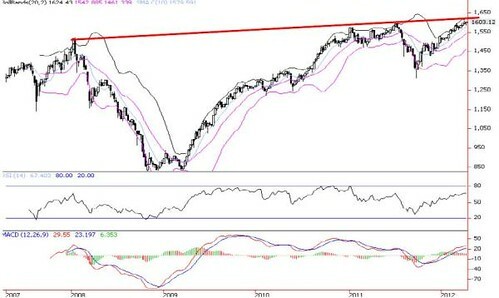 A breakdown below 1590 will drive KLCI lower towards supports at the 30 and 50 day SMAs at 1586 and 1574 respectively. We reiterate that investors should take opportunity of a sideways market to top-slice and turn more defensive. Daily KLCI - Sideways Consolidation. Weekly KLCI - Immediate Resistance Targets Near 1630 Points. As indicated by our bullish CPO commentary on 27 March, Malaysian palm oil futures rallied 1.1% to RM3621/MT, a fresh 14-month high on Tuesday, as traders continued to make bullish bets on the edible oil after industry data showed healthy export demand and lower stocks. MPOB said March’s inventory fell to 7-month low as export growth outpaced production whilst cargo surveyor data also pointed to higher exports for the first 10 days of April compared to a month ago as major importers including Europe, China and India ramped up buying. According to monthly chart (FIG5), medium to long term outlook remain promising as indicated by bullish technical indicators. Nevertheless, we could see some pullback in the near term as daily and weekly technical indicators are getting overheated. Immediate resistance target is RM3760 (monthly upper Bollinger band and downtrend line) whilst long term targets are RM4000-4100. 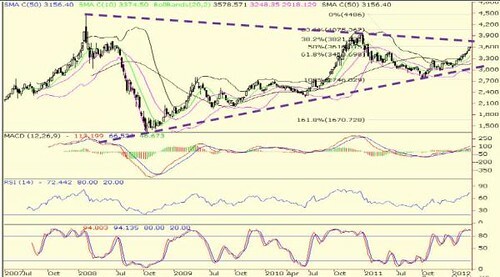 Short term retracement supports are 10-d SMA (RM3534) and mid Bollinger band (RM3467), followed by 10-w SMA (RM3375). 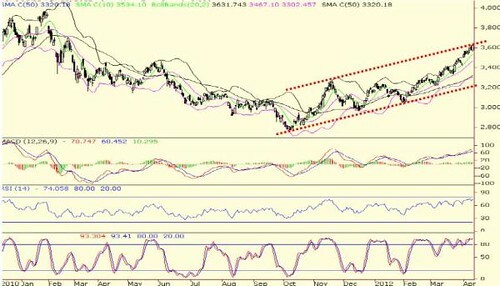 Uptrend will be disrupted if prices break below RM3400. After a 5-d slump of 548 points, the Dow Jones jumped 90 points to 12805, as concerns about Europe eased and hopes for a better-than-expected earnings season rose. On late Tuesday, Alcoa reported a surprise 1Q12 profit, lifting hopes for corporate earnings as the quarterly reporting period gets underway. This week’s other key earnings announcements include Google, JP Morgan, Wells Fargo while key economic reports are consumer sentiment and CPI. Meanwhile, European markets also recovered as investors welcomed declining yields on Spanish and Italian bonds after Spain’s prime minister said the country wouldn’t need a bailout. Asian shares markets dropped as investor sentiment were weakened following a 1.7% plunge on Dow Jones over global growth prospects and persistent worries about debt restructuring in the euro zone amid spiking Spanish and Italian bond yields. Prior to a public holiday on 11 Apr, KLCI closed 5.9 pts higher at 1597.2, spurred by active buying on blue chips such as GENTING (+24 sen to RM11.08), IOICORP (+11 sen to RM5.40), PBBANK (+4 sen to RM13.72), AXIATA (+2 sen to RM5.34) and MAYBANK (+2 sen to RM8.86) in anticipation of positive economic data in trade and manufacturing statistics. 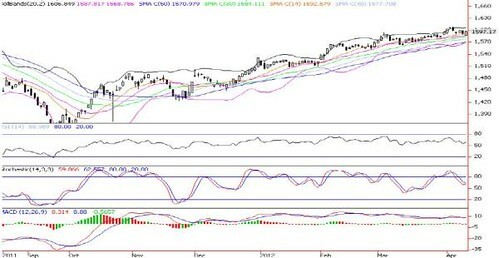 The KLCI may retest 1600 today amid overnight rebound on Dow Jones and European markets. However, in the absence of local catalysts and weak buying momentum, upside will be limited as external uncertainties prevail. 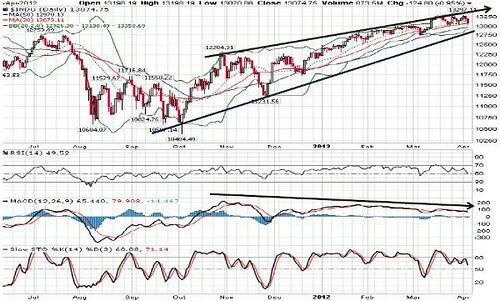 Immediate resistance levels are 1600-1610 whilst immediate supports are mid Bollinger band at 1587 and 30-d SMA (1584). 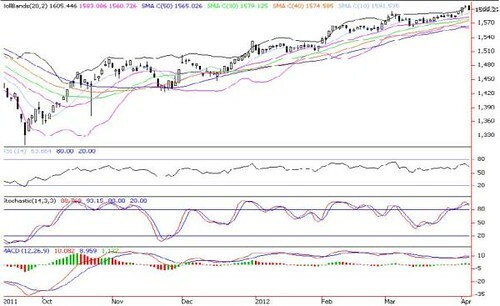 A violation of 1584 will drive KLCI lower towards 40 & 50-d SMAs at 1577 and 1571 respectively. Asian markets declined in lackluster trading as HSI, SHCOMP and TWSE were closed for a holiday. Investors reacted negatively amid fading hopes of more monetary stimulus by Fed, sluggish Spanish bond auction and an unexpected Australian trade deficit. Tracking regional losses, KLCI snapped its 4-day winning streak with a 7.4 points drop to 1559.3. Losers thumped gainers by 2 to 1 while trading volume and value retraced 5% and 19% to 1.2 billion shares worth RM1.1 billion respectively, as investors remained on the sidelines given the lack of fresh catalysts and election fears. In the wake of sluggish overnight Wall St and European markets, deteriorating technical readings and renewed fears of a prolonged EU debt crisis amid disappointed Spain’s debt sale, KLCI is likely to face more volatility ahead of the looming general election. Immediate resistance remains at 1600-1630. 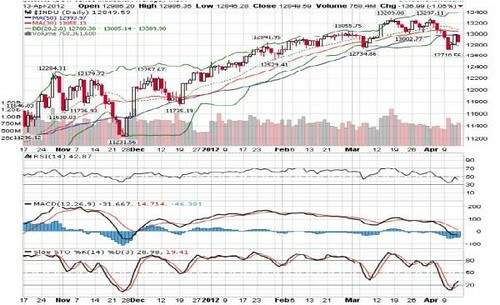 Immediate supports are 10-day SMA (1591) and mid Bollinger band (1583). A breakdown below 1583 will drive KLCI lower towards supports at the 30 and 50 day SMAs at 1579 and 1565 respectively. We reiterate that investors should take opportunity of a sideway market to top-slice and turn more defensive/nimble.